Doors to mercy: St Stephen’s Cathedral dean Fr David Pascoe standing outside the holy door on the right side of the cathedral. THE holy door of St St Stephen’s Cathedral will be knocked on three times to mark the start of the Year of Mercy in Brisbane. 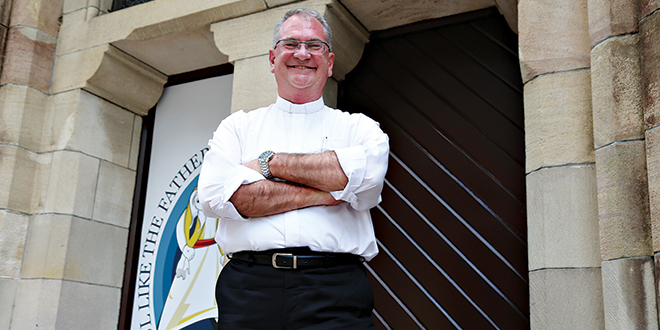 Brisbane Archbishop Mark Coleridge will strike the temporarily closed first right side door, the site of the holy door, at the cathedral on December 13. The door will be open during the day for the Year of Mercy, symbolising the same Holy Door at St Peter’s Basilica that was broken free from its brick seal earlier this month. An increased number of priests will also be available to hear confessions at the Cathedral for two hours every Saturday between 10.30am and 12.30pm. Cathedral dean Fr David Pascoe said Brisbane archdiocesan parishioners were invited to walk through the doors as a pilgrimage of spiritual transformation. Pilgrims begin the pilgrimage near two statues symbolising blood and water, located on the cathedral grounds, and through the holy door. “Pope Francis called for the year of Mercy last April, and two of the major actions were pilgrimage and penance, and really seeking to know God as the God of mercy,” Fr Pascoe said. “That really is the emphasis in a world where mercy’s not shown very much as we know at the moment. “It really is to highlight the God of mercy and particularly around forgiveness, hence the increase in the sacrament on penance. “And Pope Francis urging people to open the Churches and for people to come and really experience that God of mercy in Jesus. There are seven official Holy Doors in the world, four located in Rome, two in Europe and one in Canada. Holy Doors, or porta santa, are closed shut from the inside and opened only for a Jubilee Year, during which pilgrims are invited to walk through and attain a plenary indulgence attached to the jubilee.